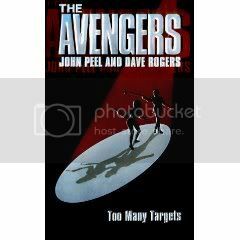 Talking of Too Many Targets - the John Peel/Dave Rogers novel that was set in the Tara era and included everyone from Dr. Keel to Tara King - shall we have a review thread of this interesting book? I've not read it for years - but would be happy to thumb through it again. However if you are planning to buy this book and don't want to know the twists, etc. Please avoid this thread until you're ready. I've never read it and don't really ever intend to but I'd still be interested in knowing what it's about etc. John Peel's Doctor Who book were pretty good mostly - well his adaptation certainly. I've read it two or three times, and consistently place it as one of the top Avengers novels. After reading so many "official" novels published during the series' run, you really appreciate the fact that Dave Rogers was hanging around to ensure that the dialogue and characterisation rang true. Sure, there's a canonical error in the description of Steed and Emma's first meeting--Death's Door established that they were involved in a car accident, whereas the book has them meeting at a party. Sort of surprised Rogers missed this--but it's accompanied by such a wonderfully funny line by Steed about the host's "buffet prowess" that I find I don't care. The other wrinkle, of course, is that its sixties setting (they're quite careful to label everything "196-" to avoid having to pin it down, but I think we can fairly safely assume that it takes place in 1969) sort of runs up against TNA, and it's not easy to reconcile the two. I sort of wish they'd put Purdey and Gambit in as well, but I understand the desire to leave the Avengers in their natural territory of "the sixties." It's interesting that John Peel writes Emma the way most fanfic writers have for years--very definitely widowed (they found a body this time), and back at work at Knight. It's almost canon, it's been done so many times. I think this works, actually. I can see Emma being a bit at loose ends at that point in her life, and structured work would probably be the sort of distraction she needed. The other characters have moved on quite believably, too: Keel volunteering overseas, Cathy back at anthropology. One possible complaint is that Cathy and Keel spend most of the book investigating on their own, eventually crossing paths, but only hooking up with the rest of the characters in time for the final fight scene. This means less in the way of, say, Emma/Cathy interaction, and no chance to see a glimpse of the Steed/Keel dynamic. But, on the flip side, the doctor and Cathy work together so well, you almost wish they'd had an episode or two to themselves. Plot? Well, it was always going to be the Cybernauts, wasn't it? It's the only recurring nemesis the show had, and hey, it gives everyone who wanted to see a Cathy or Tara Cybernauts story what they wanted. All in all, it's fanservice to the nth degree, but well-written, fun fanservice, which is the best kind. I go along with the car accident as S and Em's first meeting, but I think there was some debate on Internet discussion forums and lists whether this was indeed the case. I can't remember what the argument against it was now. I don't know if I like the idea of Emma attending a party in a leather evening dress. It's a bit like Steed wearing his bowler in the bath - just taking the characters too literally. Probably something along the lines of, "They're both great drivers. How could they get into an accident, etc.?" I don't see why it's not plausible that one of them would rear-end the other, although knowing Steed he could have easily set it up. It's quite a surprising little factoid for the writers to throw in--they usually tried to steer clear of that sort of information. If I recall correctly, Emma's dress was crepe and leather (I remember because I thought it sounded fabulous, and wished I could see it. Emma never got much in the way of decent eveningwear. Mrs. Gale was much better outfitted in that department). I get your point, but I thought it was a lovely, cheeky little touch. And who's to say Steed doesn't wear his bowler in the bath? And who's to say Steed doesn't wear his bowler in the bath? Probably has a rubber ducky with a matching hat. There was a fanfic story where Emma wore a bowler in the shower, but I don't recall whether it was suitable for a family audience! There's quite a lot of fanfiction out there that's much better than Two Many Targets. Beyond being officially sanctioned, it's not a terribly good piece of writing. It's not a particularly brilliant piece of writing, but it is fun, and fun was what I was after. TMT felt like fanfic because he seemed determined to introduce as many people from the shows past as possible, but it was basically a pulpy adventure yarn. I've read some of his DOCTOR WHO novels, so I wasn't expecting anything particularly profound. Maybe that helped? I just never particularly liked the book. I like fanfiction - I've read some great fanfiction, just as good if not better than actual published novels and stories. But I found this particular book missed the characterizations completely, especially of Emma Peel and Steed, perhaps because it was bent on hitting all those references you mention without creating an organic story. Part of the pleasure of the show, for me, is the relationships, friendships, the way the characters interact, etc. This book didn't really try to approximate that; it relied on superficial cleverness. It felt more like The Avengers film than it did The Avengers TV show. At least, that was my reaction. I don't know if you've read any Avengers fanfiction, but if you haven't, some of it is worth checking out. Free, too! I quite agree with you, Bradstreet. Too many Targets is one of the best novels on The Avengers. I made a review of a lot of them and this one gained four bowlers (out of four). Dave Rogers knew what he was writing about. Thanks for the sites, but unfortunately I can't speak French. I don't suppose you have any translations, do you? I've read a bit of fanfic, and even wrote a bit (although it was quite some time ago...) The difference between fanfic and official tie-in has become much more fuzzy in recent years. Back in the '60s and the early '70s the writers of tie-in stuff tended to be hacks with no particular interest in the TV series in question. There were exceptions (THE MAN FROM UNCLE paperback series had a young author called David McDaniel who obviously loved the show, and created ideas that were later retro-fitted into the show 'universe') but it was really in the '80s and '90s that fan writers began to predominte. The Virgin and BBC DOCTOR WHO range included short story anthologies that were, by any criteria, fan-fic. However, the product was licenced and the authors paid. Nowadays you can find official anthologies of brand new short stories concerning KOLCHAK: THE NIGHTS STALKER, which makes me wonder why no-one has published something like this concerning THE AVENGERS/NEW AVENGERS. Is there some reason why no-one has attempted this yet? Thank you so much for your cheery email! Your website looks very good! 1. When and how did you discover The Avengers ? I must have seen a couple of the Mrs. Gale episodes as a child, but the earliest ones I really remember are the Diana Rigg ones, especially the color season, which I loved. 2. Wht are your favourite season and episodes ? Season six, definitely. "The Winged Avenger" is probably my favorite all-time episode, but there are just so many good ones in that season. After that, it would be season five. All of my favorite stories are Diana Rigg ones! 3. Who decided to write Too Many Targets ? You or Dave Rogers ? It was my idea. I'd been talking to Dave after he wrote his splendid episode guide, and I mentioned that the 30th anniversary was coming up, and suggested he write a new book, preferably a novel. He told me he was no good at fiction, and suggested I try one. He had contacts to get permission, and his book was popular, so he said he'd get the rights, and I could do the work! I insisted he take joint credit, and he agreed to act as advisor on the book. I wrote up the outline, which St. Martin's Press liked. I also sent it to Terry Nation, who had been writer and script-editor on the series. Terry made a few very good suggestions - initially, I'd set the gorilla hunt in Africa, for example, and the climax would have taken place there. But Terry advised me to change the hunt to England. People would expect a gorilla hunt in Africa - but not in rural England. And he said that the whole story should remain in England, because Steed *never* left the country in the show. I thought they were excellent points, and made the story much better. 4. What was the part of work of each of you ? I wrote the entire story and then sent it to him. He made comments mostly on historical points, and added bits of description, and so on. (He taught me that the pointy end of an umbrella is a "ferrule", for example!) He also came up with Professor Lipp's name (I had Briggs or something mundane, and loved his suggestion.) But the story was mine, and about 90% of the text is mine. 7. Did you have any contact with any other members of the cast or production ? No. Dave had Patrick Macnee write the introduction, but that was all. We were actually very fortunate, because at the time I wrote the book, there were no plans to do anything with "The Avengers", so we were given complete freedom to do anything we liked in the book. I felt that it would be great fun to have all of Steed's co-workers in the book, and the villains just had to be the Cybernauts, of course, since they're fan favorites. I tried very hard to keep the styles appropriate to the era - so, for example, Keel's adventures tend to be with thugs and almost without any fantasy aspect, whereas Tara's bits are all pure fantasy, as the shows were in each of their times. 8 . Did you have any feedback from actors, the production or fans ? I did get a few encouraging letters when the fans heard of the project. 9 . The reader has the feeling that Too Many Targets could have been the first novel of a series with the return of Mrs Peel at the end. Was a sequel planned ? 10 .You have written many novels on series of the 60s : The Avengers, The Prisoner, Man from Uncle. Which one do you prefer ? I suppose my "Doctor Who" books most, because that was always my favorite show as a child. 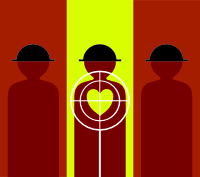 But "Too Many Targets" I love, too, as I had such fun with it. 11. Most of all, you have written novels on Doctor Who. Any chance of other books on The Avengers written by John Peel? I would *love* to write more! If only somebody wants to print them! That was really kind of you, Denis. Thankyou so much. It did confirm my suspicions as to who actually wrote the book!